Anastasia's Tinted Brow Gel is devised to keep unruly hair in place as well as added a little hint of color to define the brows, this will help to frame the eyes making them pop! 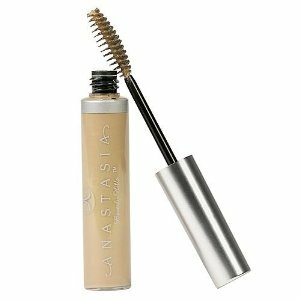 The formula should hold the brows in place all day long without flaking or leaving a sticky feeling. Anastasia has also added a botanical hair conditions and essential oils to help the hair look and feel great. This tinted gel doesn't contain any harsh chemicals but does have chamomile extract which has soothing properties, so this should be suitable for people with irritable skin. I would suggest purchasing one shade darker then your natural hair color for the brows as this creates a defining look that frames the eyes. I have very fair blonde brows and I use a brown tint. Then it actually looks like I have eyebrows! Water (Aqua), VP/VA Copolymer, Alcohol Denatured, Propylene Glycol, Triethanolamine, Carbomer, Phenoxyethanol, Methylparaben, Propylparaben, Glycerin, Tetrasodium EDTA, Hydrolyzed Glycosaminoglycans, Chamomilla Recutita Extract (Matricaria), Sodium Hyaluronate, Ethylparaben, Butylparaben, Isobutylparaben, May Contain (+/-): Titanium Dioxide (CI 77891), Mica, Iron Oxide (CI 77491, CI 77492, CI 77499), Carmine (CI 75470). Remove the wand from the veil and wipe excess product from around the base of the brush, then with a gentle sweeping upward and outward motion this will achieve the most flattering shape. Anastasia has received 5 stars by Amazon reviewers who say the tinted gel helped control their unruly brows with a natural hint of color. Patrons liked how light, long lasting and easy to apply the gel is and that fact that it doesn't flake like some gels. I think it is quite reasonably priced at $21 for 10g tube, considering it would cost at least that much if not more to have your brows shaped and tinted at a spa. You are currently browsing the archives for the Anastasia category.